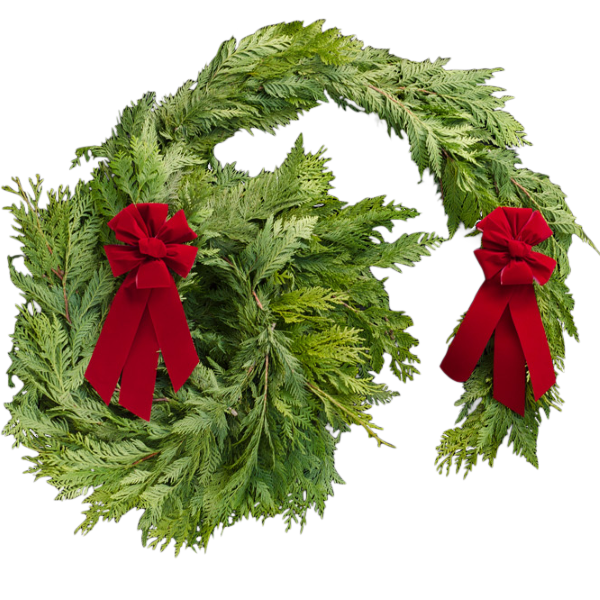 25 feet of aromatic fresh cedar Christmas garland - enough to frame a double door, and bathe every person that enters in the delightful scents of the fresh evergreen forest - with several feet to spare for windows, doorway toppers. You name it! Includes two elegant red velvet bows for that signature splash of festive holiday color. "Thank you for all of your great customer service! I am so glad to be one of your long time customers and will continue for many years to come. I send you my order and then I wait for the compliments on your wonderful Christmas evergreens that our family and friends will receive for the holidays."